We survey the formalism Calculus of Looping Sequences (CLS) and a number of its variants from the point of view of their use for describing biological membranes. The CLS formalism is based on term rewriting and allows describing biomolecular systems. A first variant of CLS, called Stochastic CLS, extends the formalism with stochastic time, another variant, called LCLS (CLS with links), allows describing proteins interaction at the domain level. 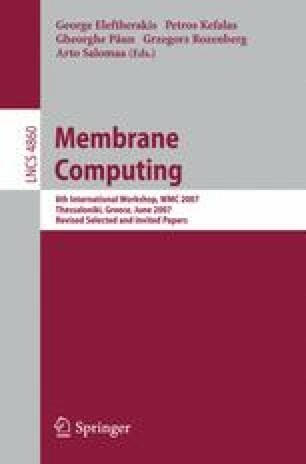 A third variant is introduced for easier description of biological membranes. This extension can be encoded into CLS as well as other formalisms capable of membrane description such as Brane Calculi and P Systems. Such encodings allow verifying and simulating descriptions in Brane Calculi and P Systems by means of verifiers and simulators developed for CLS.